So you've finished the first round of editing on your book. Awesome! You're almost done! Round two is the time for you to crack your fingers and get that delete key ready. It's also the time for your brain to get fired up, because you're probably going to be doing some nit-picking and sentence rewrites! There are three main categories I like to focus on during the second round of editing: word usage, sentence structure, and unnecessary words. Let's take a look at each section in more detail. Once again, I suggest focusing on one chapter at a time so you don't get burned out too fast. "I avoid the eyes of the Informant at the door as he scans my cuff. I can feel his eyes on me, staring me down, positive I’m the girl he saw lingering on the steps just a few days ago." "The Informant with the scanner is staring at me." Boom. Same concept, less words. The second version isn't as detailed simply because I sprinkle the rest of the detail in the following paragraphs, rather than trying to open up the entire scene in one sentence. When looking at word usage, it's also important to pay attention to your word frequency, as well as your line frequency. What I mean by that is individual words, as well as phrases. For example, in Unperfected, I used the phrase "coursing through my veins" a lot. Same with "squeeze my eyes shut." I also used a lot of stutters (I-I, Th-they, D-don't, etc) and personified a lot of emotions. Luckily, there are a lot of different tools to check your word frequency. Try searching for one online, or even using the find tool in Microsoft Word. Okay, there is sooo much I could explain about sentence structure, and it would take forever. So instead, I'm going to focus on the two problems I see most in writing: active/passive voice, and dialogue. The cupcakes were frosted (by zombies). = Passive! Zombies frosted the cupcakes (by zombies). = Active! Moving on to dialogue, which I've briefly discussed before but can't explain it enough. Once you've learned how to format dialogue, be consistent with it! I'll go over different formats below. It took me a long time to learn these rules, so don't be discouraged if you still get confused every once in a while. If you need extra help, there are tons of exercises and articles that can help you online. You'd be surprised by how many words you could find in your book that just aren't necessary! For this part of editing, focus on adverbs, repeated words, and words that just take up space. Really, very, suddenly, definitely, just, basically, totally, etc. There are thousands upon thousands of lists of words you should cut from your book all over the internet, and they're great. Use them! And there you have it! 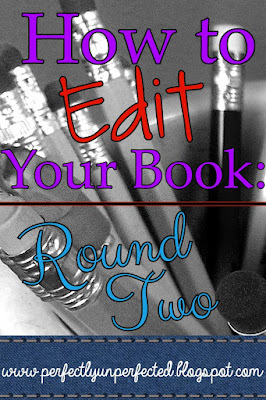 My top three categories you should focus on during round two of edits. Check back on Tuesday for round three, when I'll discuss the smaller details of grammar/punctuation, spelling errors, and more! I love this series so far! It's very useful and informative. Can't wait to see the next installment!